It’s easy for dog owners to get regular exercise with their pooches; the typical young pup is almost always ready for a run or fetch session. But cat exercise? They’re not exactly known as cooperative workout partners. Dangle a toy your kitty’s way, and if she’s not in the mood, she won’t budge. Still, cat guardians don’t have to be permanently sidelined to the couch. The trick to turning your feline into your fitness buddy is to tap into her prey drive. That way, she’ll think all the moving around the two of you are doing is about hunting, not burning calories and stretching muscles, explains Jill Archibald, feline agility coordinator for The Cat Fanciers’ Association. Talk with your vet to make sure your cat is ready for a ramped-up exercise routine and then enlist your cat to help you get moving around the house. Pick a time when your cat is naturally more energized — early in the a.m. is good. Then grab a wand with feathers dangling off the end. Go with one that has a mix of bright colors; the more contrast there is, the more eye-catching it is for her, Archibald says. “Don’t just starting running with it and expect her to follow; lure her into a chase by placing the feathers on the floor near her and weaving them around slowly in her line of vision.” When she goes to pounce, pull it away; it’ll charge her hunting instinct. Start running in circles or up and down a hallway, teasing her with the feathers for 10 to 15 minutes. You’ll break a sweat, and she’ll probably feel like queen of the jungle. Fetch isn’t just for dogs. 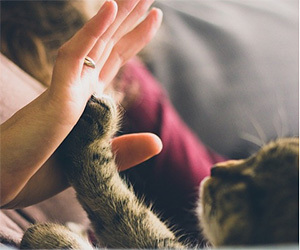 The game takes advantage of your cat’s penchant for “catching” prey and dropping it at your feet, a show of appreciation for her favorite human. Tease her with her favorite toy to get her excited, and then hurl or slide it across the floor. Your throwing arm gets a workout, and she gets to bring the toy back to you and gift you with her catch. Win-win! Pet stores sell nylon tunnels and plastic hoops you can place around a room in your home, or make your own agility course on the cheap by cutting holes in paper bags for your feline to run through and stacking cardboard boxes she can jump over or climb onto safely. Get her started by acquainting her with it, one section at a time. “Put a treat at the other end of the tunnel first, for example, and she’ll go up or through it to get the treat,” Archibald says. “Eventually she’ll get used to it and will know what to do as soon as she sees the treat, so move on to the next activity, like climbing or jumping.” Pretty soon, she’ll be whizzing through each part and having a blast, with you running alongside her. While you aim the red dot at the wall or ceiling and she’s excitedly figuring out how to trap and kill it, do a push-up, a yoga pose or stretch. “She’s exercising her prey drive while you’re doing physical moves,” Archibald says. In 10 minutes, you’ll be able to do a couple of sets of reps and your cat will have fun with the laser pointer. Just take care not to point the laser directly into your cat’s eyes for any length of time. Cats love to go vertical, and you can participate in that by tying a toy or treat to the end of a wand or stick and teasing the item over her head so she climbs higher and higher to catch it, cat trainer Lisa-Maria Padilla says. Dogs aren’t the only pets that can walk on a leash. Many cats enjoy it, too — but you’ve got to ease them into it. Vetstreet created a video that can help you decide if your cat is a good candidate and also learn the basics. Watch How to Train a Cat to Walk on a Leash. Eventually, if you cat is amenable, you’ll work your way to going outside. “She’ll want to sniff around and investigate things to get comfortable, so give her time to do that,” Archibald says. Of course, before you take her outside, check with your veterinarian to make sure her vaccines are current and she’s protected against parasites. Cute kitty strollers are popping up everywhere, and no wonder: They let your cat experience the outdoors safely while you burn calories and stretch your muscles. “Let her sniff the new stroller before putting her inside, then introduce her to it indoors, rolling her in it slowly so she gets used to the motion,” Archibald says. Put a treat in it to soothe her, and give her time to get comfortable and feel secure, not trapped and freaked out. Once she’s acclimated, it can be the perfect cat-human exercise: She gets to take in her surroundings or relax and nod off while you do all the work moving and pushing.